Ring Joint Gaskets are manufactured in various types. These Ring Joint Gaskets are developed in accordance to API6A & ASME B 16.20 specifications. We have API Monogram License (American Petroleum Institute), License No.6A-0326 and we can use this monogram on our entire range of Ring Joint Gaskets. Kammpro-Adapter gaskets allow for ring type jointflanges to be mated up to a raised face flanges, utilizingthe strengths of the full metallic with the added benefitof kamm profiled sealing surfaces laminated with flexiblegraphite. Provided the pitch of the groove is sufficientlylocated under the raised face, this design is among thestoutest of adapter styles. The Ring Joint Gaskets we offer are manufactured. Being appropriately elastic, the gaskets can provide the needed compression with a high percentage recovery. The gaskets also have a very high strength and are durable. We are offering the ring gaskets at quite a reasonable price that fits the budget of customers well. We feel proud to introduce our business domain as an acclaimed organization of Ring Joint Gaskets. 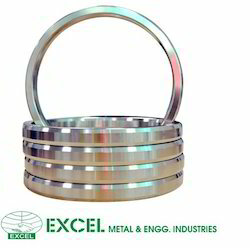 Technical Specifications: 'R' series Ring Type Joints can contain pressure up to 10, 000 PSI 'RX' and 'BX' series Ring Type Joints can contain pressure up to 20, 000 PSI The gasket and flanges must be manufactured to precision dimensions, surface and hardness. Lanco Pipes And Fittings manufacture Ring Joint Gaskets conforming to R series in Octagonal / Oval shape , Bx and Rx series of API std 6A and ASME B 16.20. They are used in the production and refining process pipelines of Oil and Gas Industries. Apple Rubber Industries Offers Jointing Technology for cured Rubber. Example : Cured Silicone Rubber New Invented Technology to joint Cured - Vulcanised - Silicone Rubber Profile - Section - Rods to form O-rings ( For bigger size ID ) , Rubber sheets can be made to required size , Air tight container silicone rings joint. We have supplied huge quantity of “Ring Joint Gaskets in different types such as R, Bx, Rx to countries like UAE & UK. We can supply these gaskets in Low carbon steel, SS304 & SS316. These gaskets are manufactured by Forging Or Rolling & then they are machined as per standard requirements. Surface coating is done as per customer requirements.